The above photo shows our cupolas on large homes with detached garages. On the left is shown a 42" wide vinyl Hexagon with Windows style cupola on a 36' 3-car garage. On the right you can see three 48" wide vinyl Ellsworth style cupolas on a 38' garage and on an 80' span on this large beautiful house. The cupolas are the finishing touch on these beautiful homes. EVERY DAY for Revolutionary Lowest Prices! Choose from our beautiful cupola selection. Let our "Cupola Specialists" guide you in choosing the perfect cupola for your roof. The most important thing in buying a Cupola is to make sure that it is large enough. The Louvered Cupolas allow for ventilation and air flow or, they can just be used for decoration. Maintenance free Azek Vinyl or Cedar. Starting at $299.00. Straight or Concave cupola roofs to choose from. Starting at $285.00. Double Louvers to enhance the look of your cupola. Starting at $639.00. Corner trim on your cupola base adds style. Starting at $679.00. Arches add that special touch to your cupola. Starting at $449.00. Add a colored Roof to a hexagon cupola. Starting at $449.00. Arches add that special touch to your cupola. Starting at $699.00. Hexagon with beautiful Bell shaped roof. Starting at $899.00. Use a hexagon Cupola as a real focal point. Starting at $749.00. rches, custom molding & extended drip rail. Starting at $659.00. This hexagon has wider louvers and an eyelid arch. Starting at $469.00. Top off any cupola with a striking finial design. Starting at $129.00. When it comes to your home, you have every reason to invest in beauty and elegance. Your home is where you make your memories, where you spend time with family and friends, and where you long to return after a long day’s work. It’s been said many times, but it’s no less true: Home is where the heart is. This vital part of your everyday life should be delightful to behold. That’s why you should give yourself the gift of a custom cupola from Valley Forge Cupolas & Weathervanes. Beautifully crafted to withstand the years, our unique cupolas enhance the appearances of homes, barns, sheds and garages. They are an investment in both curbside appeal and the invaluable feeling that your home reflects your personality. What’s more, you can rely on our Cupola Specialists to ensure correct sizing of your cupola. The value of this can’t be understated. When it comes to your home’s exterior, you must feel completely confident that anything you install has been sized properly—and our Specialists have many years of experience doing just this. In both stylistic decision-making and technical guidance, we will ensure total ease and enjoyment of your purchase. 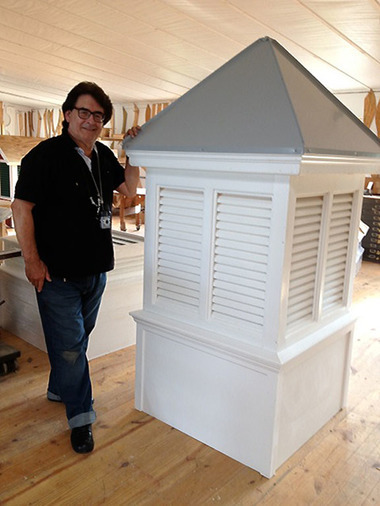 Rely on our Pennsylvania craftsmen to create the cupola of your dreams, whether you’ve selected Western red cedar, painted steel, copper, or maintenance-free cellular PVC-vinyl. Choose from all manner of styles, including louvered cupolas or window cupolas, and complete your vision with one of our many weathervanes, finials and lanterns.